The theme of this book is simple. The price – the number someone puts on a product to help consumers decide to buy that product – comes from data. Specifically, itcomes from statistically modeling the data. 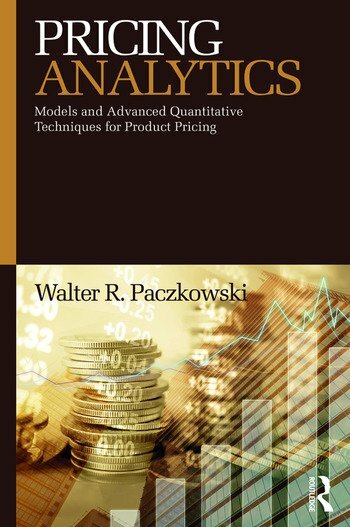 This book gives the reader the statistical modeling tools needed to get the number to put on a product. But statistical modeling is not done in a vacuum. Economic and statistical principles and theory conjointly provide the background and framework for the models. Therefore, this book emphasizes two interlocking components of modeling: economic theory and statistical principles. The economic theory component is sufficient to provide understanding of the basic principles for pricing, especially about elasticities, which measure the effects of pricing on key business metrics. Elasticity estimation is the goal of statistical modeling, so attention is paid to the concept and implications of elasticities. The statistical modeling component is advanced and detailed covering choice (conjoint, discrete choice, MaxDiff) and sales data modeling. Experimental design principles, model estimation approaches, and analysis methods are discussed and developed for choice models. Regression fundamentals have been developed for sales model specification and estimation and expanded for latent class analysis. Walter R. Paczkowski, Ph.D., worked at AT&T, AT&T Bell Labs, and AT&T Labs. He founded Data Analytics Corp., a statistical consulting company, in 2001. Dr. Paczkowski is also a part- time lecturer of economics at Rutgers University. He published Market Data Analysis Using JMP in 2016.